Encouraging Each Other. | The girl who loved to write about life. "You're a really good friend. I appreciate all you do and I love you." I got this text a few days ago and it made my day. Why? Because we all like to be seen, and loved, and appreciated. You know how long it probably took my friend to type that text out? Maybe fifteen seconds. But it went on to impact my whole day (and I'm writing this post, so maybe even more than that, really). I've been thinking a lot about how easy it is to be there for each other because of the day and age we live in with technology. Ever since the hurricane, it's been on my mind a lot. To use all I have at my disposal to check in with people (hi, that takes me roughly ten seconds) and to love them better. I'm at a stage in my life where it's not easy to be a good friend in the traditional way. It's hard to plan ahead because I rarely know Chris' schedule. It's hard to meet up for lunch or coffee because I have a toddler who doesn't like to sit still. Some days it's even hard to talk on the phone. And we all have times like that, whether it's because you have a kid, or a busy job, or are traveling a lot, or are depressed...we all go through seasons where we can't drop everything to meet at Starbucks because our friend needs to talk. But, we have phones. We have computers. We have blips of free time throughout the day. And I've felt challenged lately to use those things to my advantage in trying to be a good friend. I know the kind of friend I want to be, busy or not. I want to be an encourager. A cheerleader. A you-can-do-it-and-I'm-here-for-it kind of friend. Lucky for me, I was born in a time period where that's easy to do. I mean, I write pep-talks that people who I've never had the chance to meet face to face can read, and we can encourage each other. That's pretty amazing. I love that. So join me. 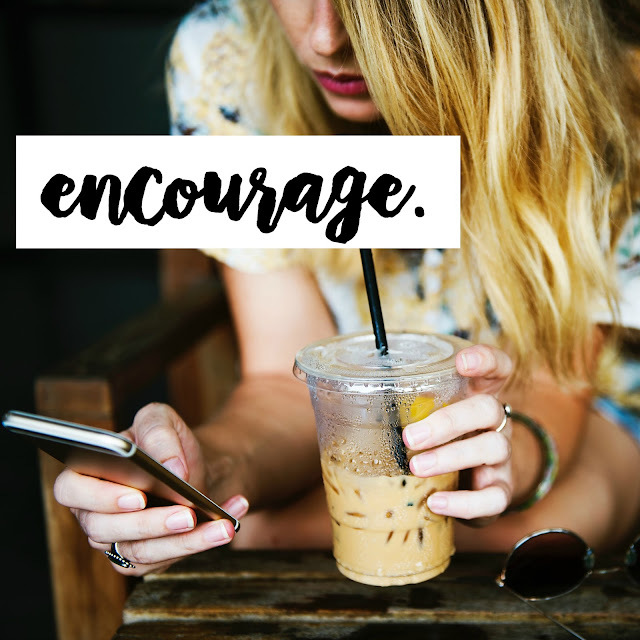 Be an encourager. Use that phone that's glued to your hand all day for good. Text a friend and tell them you're thinking of them and that they're doing a good job. When you see something good in someone, say it. When your friend posts a picture and you can tell they've lost some of the weight they've been trying so hard to lose, tell them. When you see someone killing the parenthood game, say so. When you know someone's having a rough go of it, text them. Just knowing someone is thinking about you, someone sees you, someone loves you, can go the longest way, I promise. A simple gesture can be the biggest force for good. So let's spread some good around.